Students stand in salute during the singing of the national anthem. 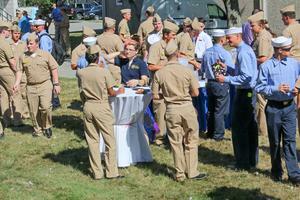 The Maine Maritime Academy campus came alive last week with the sounds of MUG week, as a new batch of freshmen (deemed Midshipmen Under Guidance until a ceremony in October) in the regimental program underwent a rigorous week of introductory training. 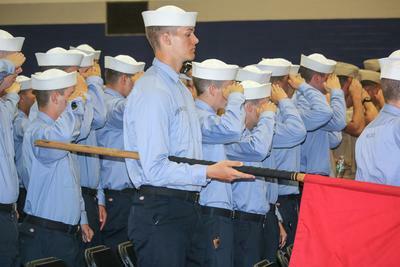 The Regimental Preparatory Training requires the students to move aboard the T/S State of Maine for the first week, living together with their companies, Alpha, Bravo, Charlie or Delta. The students went through drills, performed tasks on and off the ship, and concluded the week with the annual convocation ceremony on August 28, where President Brennan and other academy and town representatives welcomed students both new and old back to campus. 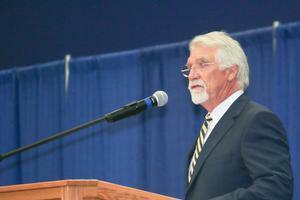 During convocation, Brennan asked the students why he had jumped into the water with them the day before during the annual ship jump event. 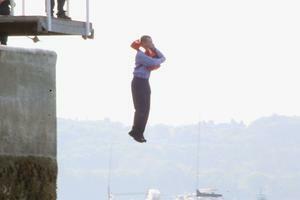 The students had been required to perform a jump off the dock into Castine Harbor and make their way to shore, showing aptitude in their training for what to do if they were ever required to jump ship at sea. Regarding the training he had received thus far, Fuller said that the first couple of days were difficult, and that it was an adjustment to get used to the commanding officers making demands, yelling instructions and having structured schedules every hour of the day. 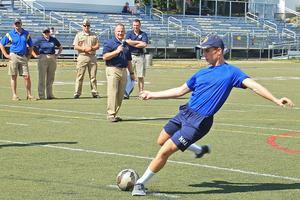 For Commandant of Midshipmen Nathan Gandy, the training is an important piece in transitioning the students from high school to the independence of college life, as well as introducing them to the regimental life they have decided to pursue. One of the highlights of the first week of the training was the MUG Olympics, during which the four companies competed against each other in events such as a dummy drag relay, Frisbee distance throw, running races and a keg pull. Charlie company pulled out the win, while Delta and Bravo tied for second. 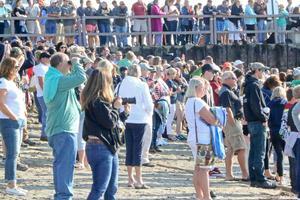 Hundreds of parents, friends, family members and Maine Maritime Academy staff cheer on the students as they jump. A MUG launches a penalty kick into the back of the net during the soccer shoot out. 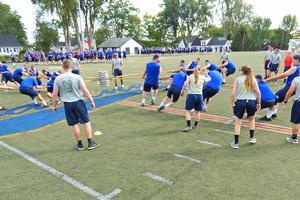 The four companies pull against each other in the keg pull competition. A student in Alpha company makes the jump. 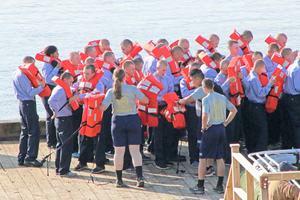 Bravo company puts their life vests on in preparation. 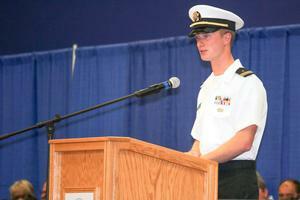 Truman Slocum, student representative on the Board of Trustees, addresses the students. Students mingle during a reception following the Convocation ceremony. President Brennan gives a welcome to the Class of 2021, and the entire student body, during convocation.